Railway Recruitment Board is about to conduct the examination for group c vacancies on 9th August. And, on 1st August, the board published a notification on the official website according to which, 26502 vacancies of Assistant Loco Pilots and technicians are likely to increase to about 60,000. An official notification for the vacancies to be increased will be issued on the official website in due course. For the computer based test, the admit cards are to be issued on the 5th of August. Candidates will be able to grab their admit cards from the region wise official websites. To appear for the test, candidates must take a print out of the hall ticket and bring it to the examination centre. Recently, the board has also revealed the exam cities and travel passes for eligible candidates. Those who are going to appear for the examination must reach the venue on time. Otherwise, latecomers will be restricted from being entered inside the exam centre. As per the reports, around 47 lakh candidates have applied for RRB Group C vacancies – ALP and technician which is a massive figure in comparison with other recruitment exams. As the exam centres have already been allotted, the board have declared that 40 lakh candidates have been designated centres within the distance range of 500 km. All the female and PwD candidates have been given centres within 200 km. 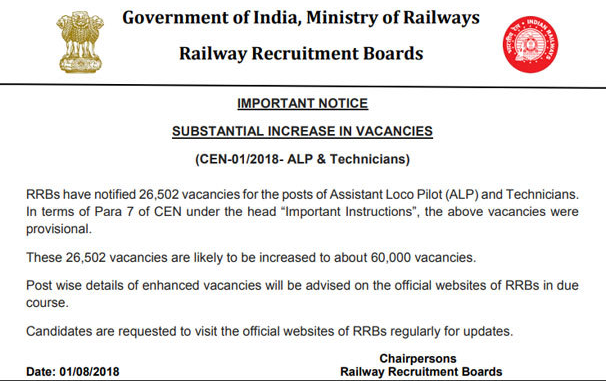 Earlier this year (on 3rd February), notification for a total of 26,502 vacancies (which includes ALP and technician only) was published. On that day, the application submission procedure was also flagged off and applicants were needed to submit their forms before 31st March. In 1st stage CBT, a total of 75 questions to be asked. Each question carries one mark. Duration of 60 minutes would be given to students to submit complete the examination. Topics to be covered are Maths, General Intelligence and reasoning, General Science and General Awareness on current affairs. After publication of admit cards, candidates should keep it safe and do not write or make any kind of special sign on it. Bring the hall ticket to the exam centre necessarily. Keep Visiting ALL INDIA ROUNDUP For Latest Updates.